This rotisserie recipe for lamb is so succulent, you’ll look for every opportunity to cook it again (not just on Easter). 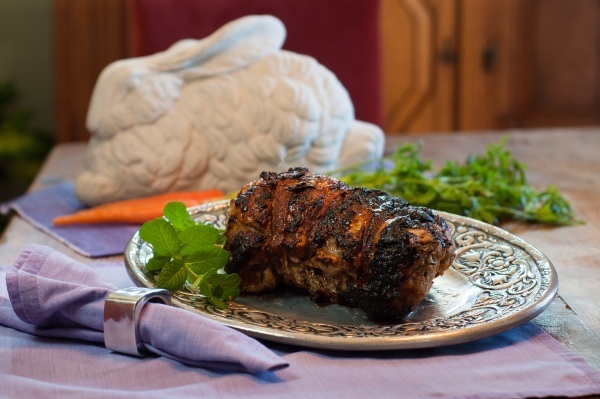 Since Ronco.com makes a Rotisserie, it’s only fitting they share their Rotisserie recipe, but you can also bake your lamb (I’ve included those directions, too). If you have any tips to share below, I’d love to hear them! I also included nutritional information so that you can plan your meals accordingly. I hope you enjoy. turning meat over several times. during the last 10 minutes. Untie, slice and serve! In a 325 degree Fahrenheit oven, bake lamb for 25-30 minutes (medium rare, 145 degrees), for 20-30 minutes (medium 160 degrees), or for 25-35 minutes (well-done). Make sure to baste at least once to keep those juices flowing (the juices in your mouth will be flowing, too). oh oh, I bought a leg of lamb with the bone in 🙁 can this be used instead? That’s what I get when going by memory instead of writing it down haha! Okay, one more question (i have never cooked lamb before…. to be truthful, have never tasted it before!). You say the oven method is only 25 – 30 mins… is that per pound? Or 25 mins total? De-boning this shouold be interesting. I did a trout for the first time last month. ;). It was interesting what my results were. I shall do what i always do, pretend it was what I intended. Hahahahah. That is great advice, Dave! Anything with a low-to-no failure rate sounds like it could be for even me!